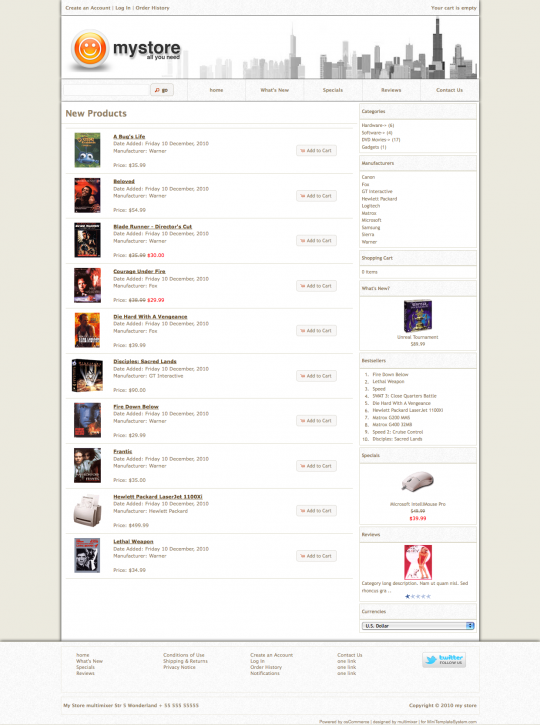 I recently got the idea, and task to my self, to create a basic, generic template for the new osCommerce version 2.3. In other words not “just” a template, but a flexible base that could carry many types of stores and open to any customization. Common sense: it’s maybe just my point of view, but some things look to me like having a “natural” order. For example, some links, like “login/logout”, or “order history” etc belong to the header. Same the information about what’s in the cart. Same, and most important, for the checkout link. Why? Because they have to be accessible any time from any page without having to search or to scroll. Same also for the boxes: not everything has to be in a box. I saw once a addon to osCommerce that was doing the incredible thing to add the paypal logo to the store in a side box, with border and titles as : “the paypal logo”. So, each template removes some boxes, depending on how it is structured: If there is a search area in the main navigation menu, there is no necessity for a search box, right? Common sense for me, I hope you share my point of view. Easy and native operation: Everything should be easy for the store owner. Easily to drop in a new template, easy to activate or deactivate it, easy to modify it. Easy to create various looks of the same template, easy to share them with friends and colleagues to get opinions, leaving the current store operation untouched. But also for developers designers, it should be easy to jump in at any point and start customizing the way they want, without having to spend the half day, trying to understand how everything is structured. 100% osCommerce compatibility: All main files should stay in their original condition without any changes. This was of highest importance to guarantee conformity and easy integration of addons and/or upgrades of the core code. Also, in case somebody wants to uninstall it, the whole system should not leave any garbage behind. This was also the hardest part, because all design had to be implemented without adding or removing css classes or changing the markup. You can say it had to be a “remote” designing only and exclusively via css and some functions. The result? Yes it is working. You can just upload a template to the templates folder, go to your admin, click “install” edit any settings you need, then click “activate” to go live with it. Much like in wordpress. A new template installation won’t take you more than 3 minutes, the de-installation (in case you want to go back to the default look) will cost you just one click. For “advanced” users it’s possible to “inject” html and css classes to critical points of the page, like before or after the main container, or the columns. This gives you the change to create even more specific designs without even touching the osCommerce files. That’s also great for template designers. The immediate next steps are to add some nice features, like a modular index page (that’s the front page and the product listing pages), modular product information page, a true menu manager for the main menu, a boxes manager to control when, where, how and under what conditions each box should be displayed and so on. 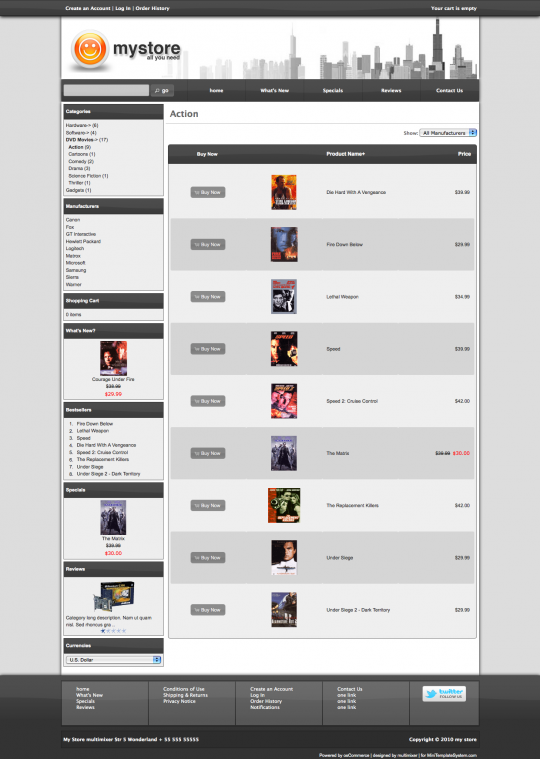 And also some more nice jquery effects, to take advantage of what is already installed in osCommerce. However, more detailed articles about will follow in the next days. I uploaded a first “demo” version of the template. 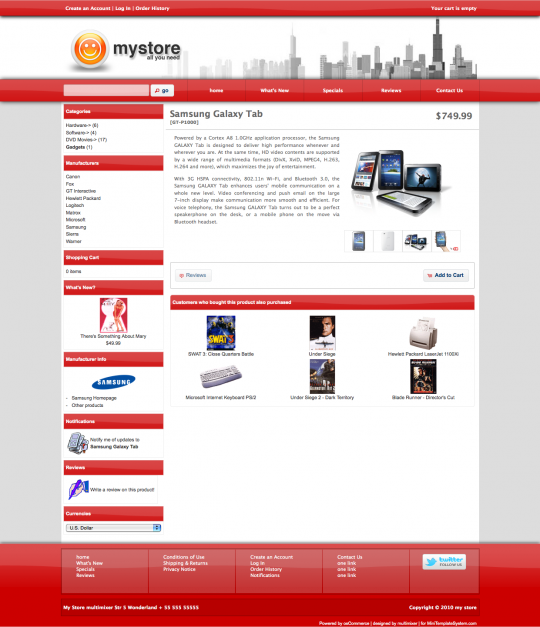 You can find it here: mini template system for osCommerce v2.3. I hope that the system will be available to download in the next days. If you see something that you don’t like please let me now, if for example you don’t see the header on the top of the page but on the right, or the bottom, thats something I would like to know. You can say it also when you like what you see always nice to hear a good word from time to time. The templates will be available to download in the next days. I really like this idea and would love to install it and have a play. Any ideas on a release date? cuando se pueda descargar te agradezco lo digas. New to OS Commerce here, but very much looking forward to trying out Mini Template system. Trying to upgrade an existing site and feeling a little daunted at the prospect of going in at the deep end just to theme it. Can’t seem to find a link on the latest post to MiniTemplate? More info will be added daily, till everything is complete, feel free to ask any questions, will be glad to answer you. ¿se puede descargar ya gratis? ¿desde donde? Going to the mini template system demonstration site, you will see a demo tool just on top of the site where you can try out any functions of the system online. Templatemonster templates may look nice at the first sight, and I guess they will also work without any problems till the moment you will need to customize them. What type of customization this could be? Let me also mention, that the chance to get support in the osCommerce forums for a templatemonster template is very very limited. The most common answer to templatemonster clients who are looking for support is “ask he template vendor”. You can check in the osCommerce forum your self for this. An other effect of this massive modification is that you have to “glue” with your template till the end of time. If you decide to change it one day, this comes equal to a complete new installation. You will have to transfer parts of your database, like customers, orders, maybe products too, to the new store and, unless you know how to do this, you’ll have to pay again. Mini template system changes the core code very very slightly. There are just very few files modified, and the modification consist in adding some code, just a few lines, to activate the template system. The core code remains clean and fresh, like just downloaded from the official osCommerce website. Mini template system’s aim is not to provide you with a template designed till it’s last detail, but to provide the necessary tools to do it your self. I don’t want to convince you to purchase mini template system, that’s up to you, and up to anyone who is looking for a solution to design his/her store. If you are searching for a template for osCommerce, then make sure hat the vendor offers support . That’s the most important thing in the long run of operating a store. Personally I would say that the best choice would be to contact a osCommerce developer directly. Many of them have ready templates to offer, but are also ready to create a bespoke one for you. Thanky ou very much for your elaboreated and detailed answer. Of course I know how unflexible the templatemonster OSC templates are (allready bought some of those) and I definitive would not recommend buying those unless you have a bit experience with OSC and most of all php. And of cousre I see the advantages that your script will give (if it will be ready fully flavoured). But I stick with my opinion: I find it too expensive for what I believe I get. Plus: I am not willing to pay 120$ just to probably find out that the script is not what I exactly needed. Did you ever consier to offer a “light” version for lesser mones, or even better, some test version for free? Don’t get me wrong. your effort on this is very appreciated. And all of th above is only my humble opinion. Mini template system has it own website with a contact form etc, that you can use to express any concerns, additional requests, questions, whatever, you might have. However, it’s completely your decision what to buy and how much to spend on your store for any type of improvement. Regarding offering a “light” version in the future, I’ll take this idea under consideration. Regarding offering a free version: I don’t think this is necessary. 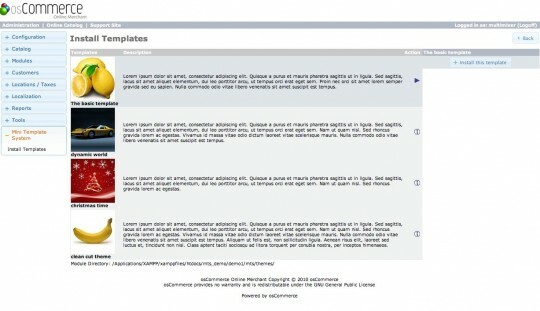 There is a demonstration site for mini template system available, where you can try it out your self. 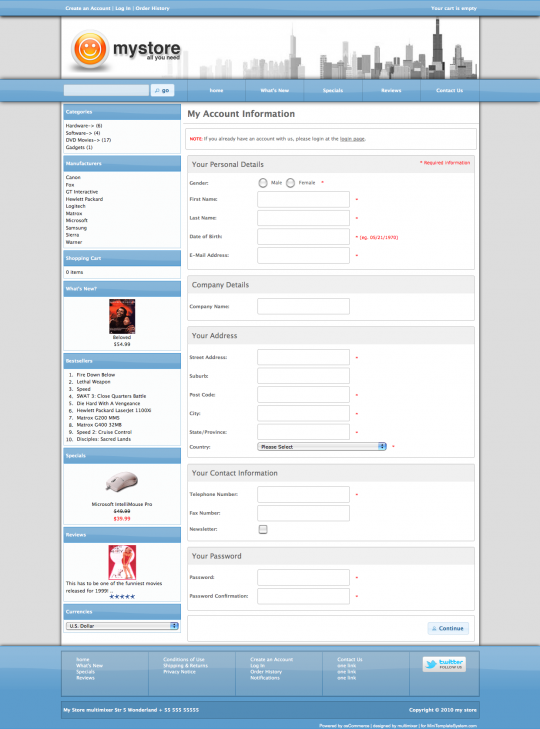 You will have the same options in your admin panel + of course the option to drop in any template easily. So you can go and try your self. If you think it’s good for you, you buy it. If not, you leave it. Template Monster make good looking templates, but are well known for mangling the code badly. Avoid. I hope to review Georges Mini Template system in the coming days, the review will be completely unbiased and will be independent of any external influences. I like your MTS a lot. It looks wonderful! I have one question, though. On my current site, I assign different css to different language so that each language has an unique theme. Can this be achieved using your MTS? Yes, that is certainly possible to do, you can have a different template per language. Any settings you see on the demo store could be adjusted to be active per language. I bought this MTS in June or July, I have about 70,000 items and somehow made MTS superfish menu option not to work. I emailed my problem to George and it took a little bit (about 2-3 weeks) but they made a whole upgrade for MTS and made me 2 other custom files just for me so the superfish menu option would work at my site. I choose this template because of option to change the design myself and it worked out great for me. Thanks again to MTS team. Thank you very much for the comment Don. There are always cases you can not think of, when developing a solution, so, any feedback is valuable and any new issue a challenge.